Browse our collection of Sacks & Bags here today to find everything for your refuse needs. Our waste sack range includes a wide variety of products including clinical waste bags in various colours, black bag disposal supplies and biohazard laundry bags. We have options for all budgets and strive to bring high-quality products directly to your business. 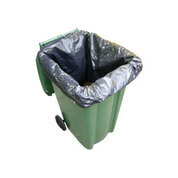 For wholesale waste disposal sacks and bags, look no further.